You’re expected to use two blank envelopes. Place your completed ballot into one of the envelopes and seal the envelope. Let’s call that ‘Envelope A.’ Stuff this sealed Envelope A into the second envelope (‘Envelope B’). It won’t fit easily, since these are probably same-sized envelopes, so maybe a little folding around the edges will be required. Anyway, complete and sign the Declaration and Signature Sheet and stuff it in to Envelope B, next to your sealed Envelope A. Find a scissors and cut the Return envelope cut-out template along its dotted lines. Tape this template to the outside of Envelope B. Seal up and stick one of those Forever stamps on to Envelope B and your ballot is ready to mail. Better instructions for all this are on the Ballot packet instructions. But you might want to read those instructions through a couple of times, before you set to work. I doubt you’ve encountered anything like this, in the past. Again, I think you avoid all this ballot origami, by phoning the Auditor’s Office and requesting an absentee ballot be mailed to you. You’ve completed your ballot and it’s ready to return, for counting. Mailed ballots must be received by the Auditor no later than March 9, 2018. NOT postmarked “March 9,” but actually received at the Thurston County Auditor’s by March 9. If you are mailing it, best to get it into the mail as soon as you can. As an alternative to mailing, you can drop your completed ballot at the Thurston County Courthouse drop box. The drop box due date is 3 PM, March 3 (not March 9, as is the due date for mailed ballots). Your ballot still has to include the Declaration and Signature Sheet, be inside all its envelopes, with the Return envelope cut-out template taped to the outside. You may not return this ballot to the normal drop boxes, like the one outside the Griffin Fire Department Headquarters. Only the drop box at 2000 Lakeridge Dr SW will do. 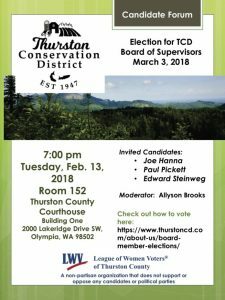 Those of us who choose to don tinfoil hats, from time to time, may be excused for asking, “Why does it have to be so difficult to vote for a supervisor of the Thurston County Conservation District?” Apparently, this is the means provided by Washington law. I think few of us would characterize this process as one that results in increased voter turnout. It’s just one of the reasons I’m encouraging my fellow rural voters to participate in this particular election. As an alternative to ballot origami, voters may cast their ballot in person at TCD’s poll-site election on Saturday, March 3rd between 10am & 3pm at the Thurston CD Offices (2918 Ferguson St. SW, Tumwater) in conjunction with the TCD’s Annual Native Plant Festival. In closing, the Thurston Conservation District provides valuable services available to property owners on an entirely voluntary basis. I believe, the more you know about the TCD, the more you’ll want to endure the rigors of sending in a ballot to fill this position on the District’s Board of Supervisors. 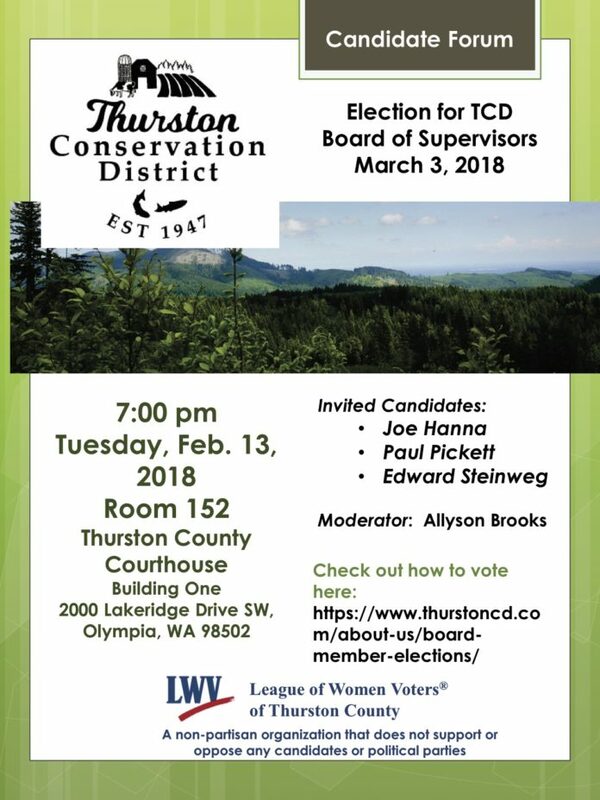 Posted in Thurston Conservation District. The remainder of their instructions had to do with the two options for voting (the “absentee” ballot and in-person voting).